Beate and Paul Epp made the leap from Canada to Mexico in 2012. For 13 years they ran a hotel and organic farm, but having taken many vacations to Mexico, they had always felt a strong pull to move there permanently. 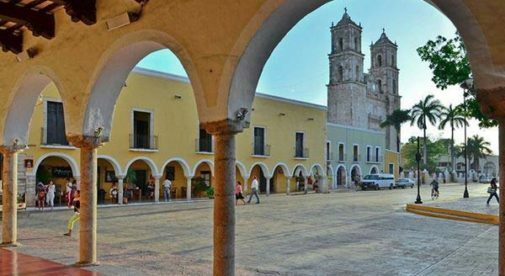 “We settled in the beautiful colonial city of Valladolid on the Yucatán Peninsula. 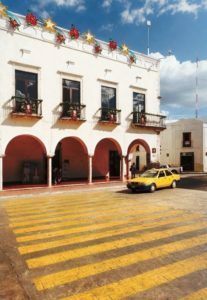 Valladolid is a charming, safe, and beautiful city, with a culture heavy in ancient Maya influences, while displaying the famed Spanish colonial architecture. And it is just the right size, with a growing, but not overwhelming tourism industry,” says Beate. Once they settled in, they promptly bought a lovely old colonial home and began converting it to a B&B. “Our home was quite lovely to begin, but we added three guest cottages in our large garden area. Each cottage has two bedrooms. We also added a beautiful pool. Inside the main house, we restored the large dining room, which has a huge table for sharing communal meals with our guests,” she says. An example of the striking colonial architecture in Valladolid. Beate says she enjoys doing most of the cooking. “I do have someone who comes in to help maintain the pool and garden as well as helping to clean. But for the most part, I do much myself and enjoy it.” Her guests come for the healthy food as well as the ambience. “Our property is quite lovely but the city of Valladolid and the surrounding area is wonderful. The Spanish architecture is stunning; nearby Maya ruins date back thousands of years; there are many cenotes (clear, deep freshwater pools, naturally occurring in the limestone) where our guests may swim and explore; and even the local open market is worthy of at least several hours,” she says. 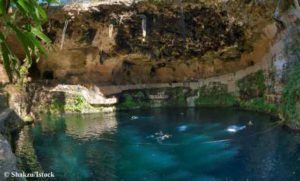 The cool, blue waters of Cenote Zaci located in the town of Valladolid . Beate and Paul charge according to the season. In high season (December 15 to March 15) the rate is $110 nightly, including breakfast. The rest of the year, the rate is $85 per night. The majority of their bookings come from bookings.com, with direct bookings from their website running a close second, and Airbnb coming in third. Beate and Paul have six dogs, all rescues, who live with them and politely interact with their guests. They also keep three rescue horses on another piece of property. “I’ve loved horses for as long as I can remember,” says Beate. “I think the time is approaching when I want to finally retire and move out to our other property to spend more time with my horses,” she laughs.